Taking out a loan is a huge commitment. You’re expected to make payments every month and the loan term could run for a few years or a few decades. This calculator will help you figure out your regular loan payments and it will also create a detailed schedule of payments. First enter the amount of money you wish to borrow along with an expected annual interest rate. Then input a loan term in years and the payment interval. Click on CALCULATE and you’ll see a dollar amount for your regular weekly, biweekly or monthly payment. For a printable amortization schedule, click on the provided button and a new browser window will open. Your loan may have a fixed time period and a specific interest rate, but that doesn't mean you're locked into making the same payment every month for decades. 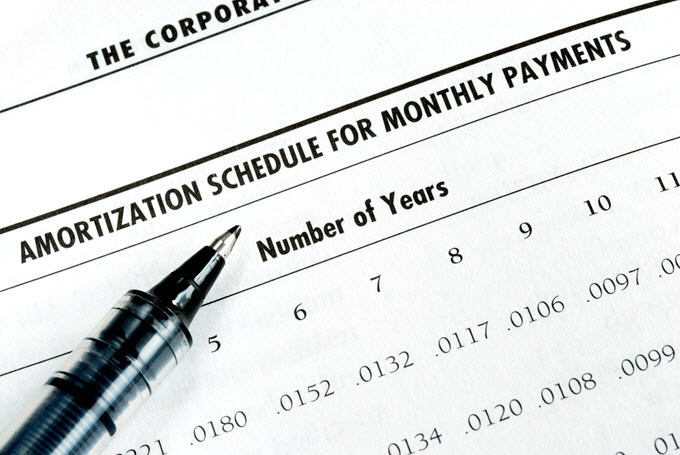 Loan amortization doesn't just standardize your payments. You can also take advantage of amortization to save money and pay off your loan faster. When you get a loan from a bank or a private financial institution, you have to pay interest back on the money you borrow. The amount of interest you pay on the borrowed money, or principal, changes as you pay back the money. Basically, the less principal you still owe, the smaller your interest is going to end up being. To keep loan payments from fluctuating due to interest, institutions use loan amortization. Amortization takes into account the total amount you'll owe when all interest has been calculated, then creates a standard monthly payment. How much of that monthly payment goes to interest and how much goes to repaying the principal changes as you pay back the loan. Initial monthly payments will go mostly to interest, while later ones are mostly principal. One significant factor of amortization is time. The monthly payments you make are calculated with the assumption that you will be paying your loan off over a fixed period. A longer or shorter payment schedule would change how much interest in total you will owe on the loan. A shorter payment period means larger monthly payments, but overall you pay less interest. If your loan is set on a 30-year time period, as are most mortgages, one way to use amortization to your advantage is to refinance your loan. Refinancing is how you change the schedule on which you're required to pay off the loan, say from 30 years to 20 or even 15. This accelerates your payments and reduces your interest, with one serious drawback: Your monthly payment increases. It may increase more than you can afford, which is what prevents people from refinancing to a shorter-term loan. Refinancing also isn't free. When you refinance a loan, either to get a lower interest rate or to change the loan's time period, you have to pay a small percentage of the amount of principal you have left. You also have to pay several fees, which depend on the state and lender. When considering whether to refinance, you have to figure out whether the savings you'll get will be more than the amount you have to pay to refinance. You also need to consider how no-cost refinancing affects amortization. No-cost means that the fees aren't upfront, but either built into your monthly payments or exchanged for a higher interest rate. You generally end up paying slightly less if you pay the fees up front, since sometimes you end up repaying them with interest if they're amortized with the rest of your loan. If the goal is to get your loan paid off faster and to save money in the process, no-cost refinancing might not be the best solution. However, if you can manage it, refinancing at the right time gets you a lower interest rate so you're saving money both by reducing your interest rate and by paying off your loan faster. Another way to take advantage of amortization is to increase your payments without refinancing. The market may not be in the right place to refinance since interest rates fluctuate and you might not end up saving much or anything if you refinance at the wrong time. Instead of increasing your entire monthly payment by making your loan period shorter as you would when you refinance, you simply pay more than your monthly bill when you can afford to. These extra payments do not go toward interest, only toward the principal you owe. You will not see any reduction in later monthly payments if you do this, so be sure you aren't using up too much on one monthly payment only to be financially strapped the next month. The advantage to this system is that you will pay off your loan faster, which will result in less interest. You'll reach the end of your payments ahead of schedule, which helps you save money. You also aren't committed to making a higher payment each month, and you have control over how much extra you pay. While it's a good idea to commit to a standard amount each month for your own financial planning purposes, this option leaves you with more room in your monthly financial planning, since you're paying more than what's expected and can reduce that extra amount should you need to. Consider refinancing to get a lower rate, but not a shorter-loan term. Then, apply what you save in interest payments and any extra payments you can afford to paying off your principal by making extra payments each month. Interest rates need to be lower when you refinance than they were when you got the loan, or refinancing is a bad option. It's hard to predict when to refinance, since the market is constantly changing, but a financial planner and refinance calculators will be able to help you choose the right time to refinance. When done right, this reduces your interest payments in several ways. First, your interest rate is lower to begin with. Then, you pay off your principal faster, which means you end up paying less in interest. Also, you aren't strapped into a higher monthly payment, so if your finances change or if you got used to a certain monthly payment, you won't be stuck paying hundreds of dollars more for a shorter loan period. Take advantage of loan amortization and get your loan paid off sooner. You have several options for paying off your loan faster than scheduled, so consider which is right for you and start planning. Ultimately, the faster you pay off your loan, the less you'll end up paying in interest, so accelerating repayment is a good financial strategy.